Do you let Ben Franklin make your decisions? In response to last week’s post about 10 Brain Reasons for Delaying a Decision, a number of readers mentioned using the Ben Franklin Pro vs Con list. This is the most common and easiest strategy used to finalize decisions, including those where choices may be difficult or complicated. It seems straightforward enough to compare positive and negative features. List all the positive features or aspects in one column and compared to all negative features or aspects in an adjacent column. Some decide on the total number of items listed in each column – the highest being the dominant choice. Others do an analytical comparison and decide on which makes the most sense. Still others do an emotions-based comparison and decide on which one “feels” right. And, there are still others who bring their own unique rating factors to the process. While the Pro and Con list may seem fair, reasonable and logical, Ben Franklin was keenly aware that such simplicity didn’t necessarily given the best results. His complete method included several other steps to ensure a better decision outcome. First Step: Wait a few days and then return to the list and edit each column for additions or deletions. Second Step: Rate each item in each column for its value of (I) Importance (rate from 1-10, with 10 being most important). Third Step: Repeat the process and rate each for its (P) Probability of success (rate from 1-10, with 10 being the greatest probability of success). Fifth Step: Add up the (IxP) total for the Pro column, and do the same for the Con column. You will now have two numbers. A total value for the Pro column and a total value number for your Con column. The column with the higher number will tell you where you place greater importance and how you view the probability of a successful outcome. As an example, I used this 5-step method to decide whether to invest in a training course. It was a large conference, and I get more out of smaller events where it’s easier to get questions answered. While I fully expected the results to go the other way, in favor of feeling right about signing up for this course, I came to the realization that money was a bigger issue (course + travel expenses+ videos). Consequently, this allowed me to refocus on how I was allocating my money and plan for future events. If you take the short Pro vs Con list comparison you have one result. If you take Ben Franklin’s advice and go for the longer version of considering Importance and Probability you may come to a different result with greater insight. If you get identical results, then rest assure Ben Franklin would be proud of you for making the best decision you can. Would you consider spending more time evaluating your Pro and Con list for qualities of Importance and Probability of success? 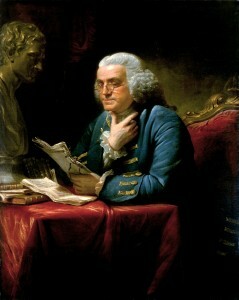 Image: en.wikipedia.org, Franklin in London, 1767 painted by David Martin, displayed in the White House. I’ve never heard of the Ben Franklin method, I typically go with my gut… not very scientific but it usually works. I do want to give this a try next time I’ve got a big decision to make. Thanks!! There’s a nerve that runs between your brain and your gut. It’s all connected. You’re just listening to one end more than the other. It never hurts to try out the Ben Franklin method and see how it stacks up against your gut. (Oh, make sure your gut gets plenty of probiotics, but I’m sure you’re doing that anyway). Love the Franklin approach — the pros and cons of the pros and cons. 😉 Makes total sense. Will save this and apply. Thanks so much for sharing this. Glad you found this to be a potential tool for you when it comes to some of your decisions. Joyce – I don’t think I’d ever get this labor-intensive about making a decision. OTOH, what could it hurt? I’ve seen people, (especially women) make disastrous decisions based on emotions. A nice little 5-step algorithm might have helped. Ideally, we need a little of both – some logic and rational and some honest feelings. I can sympathize about not wanting to turn it into a big production number, but the bigger the decision the more caution is needed. Anyway, it’s a process with options. I use so many of Ben Franklin’s tricks. He managed a whole lot and I, too, use his pro and con list when making decisions. Hey Rachel, a real Ben Franklin aficionado response. You’re a rare breed. Thanks for chiming in. Glad you enjoyed the post. Will probably be writing more about it in the future. It sounds like the 5 step Ben Franklin method is a much more thorough process than a simple pros and cons list and therefore helps you to think more about what is really important to you. With really big decisions I think it’s a good idea to factor in importance and probability of success. Tamurai, yes the factoring of importance and probability of success certainly can change the dynamics of the decision process. However, if you have other factors that might apply you can add them in as well. Thanks for commenting. I love this, such a great way to look at it. Especially for those of us how might be impulse buyers. Stop and really think and digest your decision. Thanks for sharing. Yes, this a great way to slow down the impulse buying. At the very least, a simple comparison of the pros and cons will tell if there are enough pro reasons to make the investment. It may take more practice for those who will disregard all the negative reasons and buy anyway. But, that’s life. Nice technique and a great example. With some practice, this can become an automatic habit. It’s a great tool when it comes to making decisions, not the only tool, but one that’s good for most situations. It would be great if it became automatic, but human nature always wants to think it can make decisions on its own. Interesting “decision making” method, Joyce, thank you for sharing it! I had no idea that Ben Franklin used this method…. I will try to apply it to some important decisions I have coming up! Yes, old Ben Franklin it seems was wise on many different levels. Using his method is a good place to start and will give you a good overview of what’s exactly involved in the decision you are making. I love the Ben Franklin method! It gives the illusion of making an emotional decision seem logical! But really, I do use it and think it works well. Carol, you’re the first one to point out the illusion with an emotional decision. No doubt about it, emotions pay a big role in making decisions. Most people don’t factor in the emotional component, and that will be another post in the near future. Great way to take the emotion out a big decision. Thanks. Yes, Diane by sticking to the reasons for pros and cons you seem to outwardly remove emotional associations. This would seem to lead you to a logical and rational decision. However, research shows that emotions continue to pay a role in the final decision-making process even if we are not aware of them. The more complicated the decision, the more emotions are involved. I’ll be writing more about that. Thanks for commenting. This is a powerful analysis. This is similar to how I choose my last employer. I used 93 questions and weighted the answers and the questions and multiplied those to see which companies offered good fits. Christy, good for you. Taking the time to create your questions and analyze your weighted answers must have made you feel confident when you had to make your final decision. It works well for most decisions, Joan. However, when you have multiple factors or more than two choices things can get a little crazy trying to track everything. So, there are other decision options out there. Also, I’ve responded to some other commenters about there being emotional issues that crop up into the process. But, in general, the Ben Franklin method will give a good overview of what are the important pros and cons to consider in your decision choice. This is an interesting way of looking at the pros and cons in more depth, Joyce. I used to be so analytical for almost every decision I made, mainly because I would have so many questions come up that I needed to be clear on the answers before “deciding”. As I’ve gotten older, I still do weigh things in a similar way to the importance and probability model, and yet I do also, (as I’ve mentioned before), really trust my intuition and my gut. If something keeps “screaming” yes at me, I do pay attention. If I come back to it a day or a week later and the feeling isn’t as strong, I generally don’t do it. Recently I enrolled in a one-year program that was moderately priced, as I felt called to the information webinar plus when on the webinar, it spoke very loudly to me. I delayed my decision and had 3 or 4 calls with the team before actually saying yes. Even with a free half hour coaching offer for the first 200 who registered, it still wasn’t enticing enough. As it turned out, they decided to extend that offer to anyone who was on the initial two info webinars, which meant I received it anyway. A good example for me of not being afraid you will lose out and rushing to decide, and just going with what is right for you in the moment. Beverly, you touched on a key element here of how people can process information differently. You can have high functioning analytical types who want as much detail as possible and on the other end the spectrum those that will operate from intuition alone. And, for each, it may be the best decision process that gives them good results. What’s important in both cases is that the brain is operating in a manner where the person is comfortable trusting the results. On a metaphysical level, all information is vibrating energy, and a person who is working intuitively is tapping into this source. The analytical person needs to see it to believe it. Everyone has to go with what they trust, and when it’s no longer trustworthy, then it’s time to reassess what’s going on. Personally, I like to visually see the pros and cons, but in the end go with my intuition. I had not heard of the Ben Franklin approach until I read comments to last weeks blog, so I thank you for explaining it. I love the thoroughness of his approach, yet to be authentic, I’m not so systematic that I would take the time to do it. I’m not sure exactly how I arrive at my decisions other than knowing I’m decisive. I don’t procrastinate- might sit on it for a day or 2 & once decision made, I don’t rethink it. If its a go, I go. If I pass it up, I feel light. Making sense here? Yes, you’re making sense. I think when you are older you have more life experience and sense of what’s right or wrong for yourself. Your brain is filled with years of decision experience, which become templates where your brain can quickly respond to similar decisions or even know when to pause for a day or two to further process for certainty. Thanks for sharing Roz. The bigger the investment or the higher the importance, then the more I am willing to invest in making that decision. I had not heard of the 5 step process. I can see how it would work. Your very right Karen. Most of us are good at the day-to-day decisions, but much less so with the big ones. The Ben Franklin Pro can Cons list is a place to start, but with very complicated decisions there are other methods that can be used. Interesting, indeed.. but a simple case of measuring the pros and cons… just like with anything else and seeing what is more important. It goes back to that old phrase “seeing is believing.” Visually laying it out side by side as a list of pros and cons can make the implications of the final decision more real for some people. Thanks for sharing your thoughts. I can see this is a practical solution with the use of either of both process. And can certainly help in making the ‘right’ decision. I am more apt to use pro and con lists and review – or seek inner guidance and intuition. I had never heard of the probability method, thank you for sharing. I responded earlier to Beverly about this same thing. Using the pros and cons list helps to define what the decision is really about, and adding the probability of success into the mix adds a new perspective to the process. Using intuition is not for everyone, but if you find your’s is trustworthy, then go with what works for you. Appreciate that you took the time to comment. I never heard of this method before. I am going to try it. Thanks for sharing. Keep me posted on how it’s working for you, Sabrina. Glad to help if you run into any problems. Making decisions is one of my least favorite tasks! I had no clue that Ben Franklin developed the Pro/Con list, so that was an interesting tidbit. Using your real life example was especially beneficial since I’m frequently weighing whether or not to buy online training courses. 😉 With so many marketers using scarcity as a buying/purchasing tactic, I find myself unable to “sleep on it,” which is normally one of my best tools for decision making. Thanks for sharing some techniques that I can use in the future. Ben Franklin was quite a guy for his time – inquisitive mind and always about practicality and efficiency. I agree with you about when marketers pressure you to buy. However, I know that they know most people stall over committing unless there is an incentive to get them to commit. So, when we are the marketers we want customers to decide as quickly as possible, but when we are the customers, we want to be certain that we are making the right decision and not be pressured. Good marketers need to consider there are those who just need to feel more comfortable in their decisions and allow for more time. What a great method, Joyce! One thing I’m lax about is the third step–probability for success. You know, crazy as it sounds, I’ve never considered that. How nuts am I? LOL. But I’m absolutely adding that to my list! Adding the probability of success can be a make-it-or break-it factor for some decisions. Ideally, you don’t want to get carried away with too many value judgements. But, you can also tailor the process and add other factors that might have a critical effect on the final outcome. Thank you for sharing your thoughts.